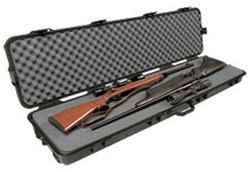 Non-Residents who do not hold a Massachusetts FID firearm license may transport and possess rifles and shotguns of "non large capacity" in Massachusetts for target shooting activities or to participate in hunting activities if in possession of a valid hunting license. Please read the Definitions document downloadable below for a description of "large capacity", and note that it includes all assault type rifles (AR, AK, etc.). Non-Residents who do not hold a Massachusetts LTC pistol license may transport and possess handguns in Massachusetts only to participate in a bona fide competition, a gun show or a meeting of firearm collectors, but we suggest that you carry a flyer regarding that activity with you in your vehicle. In all instances noted above you must carry your guns in a locking container, excluding a glove box or console, and they must be unloaded. Please note that Massachusetts has an Assault Weapons Law that mirrors the old Federal law that expired in 2004. Therefore, you may not bring magazines of greater than 10-round capacity into Massachusetts unless they are "pre-ban" (manufactured before 9-13-1994). SPECIAL NOTE: Please see the Assault Weapon Ban info on the Bulletin Board page before bringing and assault weapon into Massachusetts. Non-Residents may not purchase ammunition in Massachusetts, so you'll have to bring your own. The best practice is to lock it in your trunk or in a suitable container (i.e dry box). Please review the following PDF documents for details, and contact the Stockbridge Sportsmen's Club if you have any questions.